Condomínio JC10: 4 quartos, 3 banheiros, acomoda 7. Apartamento novo e luminoso com 100m2 Ocean View 10º andar no 9º bloco da Avenida José Pardo. 2 quarteirões do supermercado Vivanda Está idealmente localizado a uma curta distância de lojas de luxo, restaurantes, cinemas, etc 4 quartos 3 casas de banho Miraflores Apartamento Totalmente mobilado e equipado 5 camas, sala de estar, sala de jantar, cozinha e área de serviço com uma lavadora / secador Com internet tv a cabo e telefone. Prédio tem comodidades, piscina, academia, playground e área para churrasco no prédio. Segurança 24h e porteiro. QUATRO BLOCOS DA PRAIA, VARANDA: 4 Quartos, 3 banheiros, acomoda 7. - Segundo quarto: 1 cama de casal, armário, TV de tela plana. - Quarto quarto (sala de serviço): cama de solteiro, closet, banheiro. - Casa de banho completa para compartilhar com o segundo e terceiro quarto. - Há uma varanda no apartamento. - Lavanderia: Lavadora e secadora de roupas, ferro e tábua. - Piso de madeira em todo o apartamento, exceto cozinha e banheiros. - Dois elevadores no prédio. Um bloco de um supermercado muito conhecido em Miraflores !! We had to move properties last minute, and the place was slightly off ideal. Regardless the customer service was good and property nice (was not this property listed). Really close to the beach!! The is located in a very quite street in busy miraflores, really close to the beach and some really good restaurants. Shops are nearby and it even includes a washing machine, which was tremendously helpful after some weeks of travelling. Gisella is a really nice host that made booking close to last minute possible. I am happy to know that you enjoyed your stay in my place. We are going to be glad to host you again for your next trip to Lima,Peru. I came to Peru to my sister's wedding. I got in contact with Alquileresperu and I received the best service in comparison with other rental companies. It is a nice apartment, walking distance to the love's park, the malecon, Wong supermarket and Kennedy park. It has a nice view from the living room and bedrooms. It is well located and I will definitely recommend it. I am pretty sure I'll back soon! Thank you! It's great you enjoyed your stay in this nice apartment! This place was AMAZING! the doorman at the building were very welcoming and accommodating. 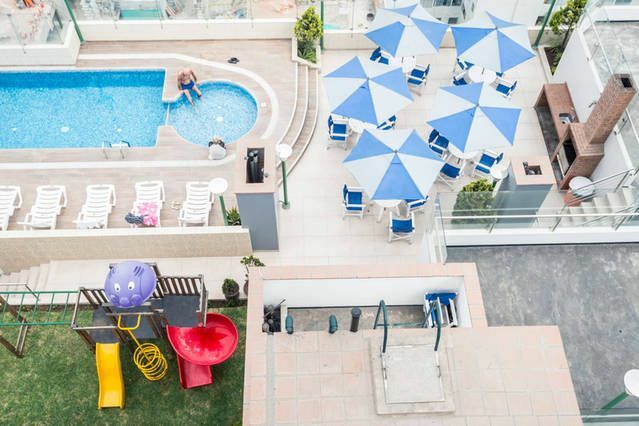 The apartment was exactly as described and in a perfect location in Miraflores. We felt very safe and clean, in a very walkable neighborhood. It was close to Larcomar, a nice outdoor mall on the sea cliffs that had everything you need. The building was quiet - it felt like home. I will come stay again the next time I am in Lima. Great place, good location, great reservations team. Tracy is great!, sending me emails with the updates, information about the place and always very accurate with the info, no hidden fees or anything. After I booked the apartment, I got a call from Rosario, his assistant, also very nice and professional. Place great, as described, beds are super comfortable, and location is the best, few blocks from Larcomar, and you are on the strip, great place for a run in the morning, breakfast, or dinner at night. Location is also great in case you want to go out at night, Larcomar has two night clubs and you could party all night and walk back home with no worries. Apartment is nicely located, it's on the 6th floor, so great view from there. Internet in the apartment is good, and kitchen has all you need to make your stay more enjoyable. Amazing experience, great host, and great times in Lima like always, I'll be contacting Rosario again, no doubt for my next visit. Thanks!!! This apartment was in a great location where you felt safe. In addition, the views were excellent and the owners kind and easy to meet with and helpful. The apartment includes many things you will need from a microwave to stove and refrigerator (full size) and even a coffee pot and pump pot to keep it hot during your stay. Plenty of hot water and bathrooms for each bedroom.We loved sitting around the all glass wall overlooking the park/ocean/hanggliders! . We walked daily to Larcomar mall and once up the street past Parque del Amor to the numerous pizza restaurants (yummy!) and ate according to our Lonely Planet guide at La Glorietta (Pasaje Juan Figari 181) just off diagonal. The crust was buttery flavored, garlic fresh and even my kids (ages 12 & 15) loved the flavor. We loaded one up and had one with only cheese and pepperoni. As in most homes and apartments in this area, there was no a/c which wasn't needed since you had windows to open. We felt comfortable with the temperatures. We would definitely stay here again if coming back to Peru in the future.